MORNING MANNA : Nov 02 - GOD IS GOOD ALL THE TIME! 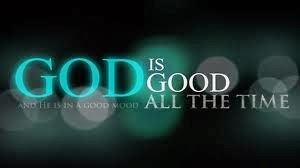 Nov 02 - GOD IS GOOD ALL THE TIME! Yes, God is good all the time if we know just one secret “TRULY GOD IS GOOD…EVEN TO SUCH AS ARE OF A CLEAN HEART” (Psa 73:1). Oh, how wonderful it would be if the whole world came to know this blessed secret: GOD IS GOOD ALL THE TIME – in winter times and summer times, birth days and death days, funeral days and festival days, feasting days and fasting days, mourning days and dancing days, days of prosperity and days of poverty, days of trials and days of triumphs, sick days and healthy days! However, there is only one condition: KEEP THE HEART CLEAN! Although David was a man of God who loved the Lord and walked with God, one day he lost his purity of heart. Then he felt as much pain as if all his bones were being broken, and he lost all his joy. Thank God, he knew the secret of restoration and cried out, “Create in me a clean heart, O God; and renew a right spirit within me” (Psa 51:10). How sad it is that millions of people, including many Christians, are ignorant of the fact that a wrong spirit (getting irritated, angry, etc.) is the result of an unclean heart! When the heart is clean, the spirit will be right. Dear friend, are you looking for a way out of your bitter trials? Do you want God to turn them all into sweet and blessed experiences? Keeping the heart clean is the secret of a joyful life flowing with milk and honey.